Bleach Chapter 564 is the next and first Bleach manga chapter to be released this January 2014. A lot of Bleach readers are already asking when would the next chapter, Bleach 564, be released? To give you a quick answer to your question, Bleach 564 release date would probably by January 15 or 22 (the least possible). But I’m more positive that Manga Shonen Jump will resume by the 15th. Bleach is not on a week break, but rather on a holiday break (New Year) which is expected and has been a trend for the past years. Don’t worry Bleach fans, I’m sure you are all excited to see Renji’s new Bankai, a more powerful Blade, thanks to their training while there were still in Zero Division’s place. What do you think will Renji’s new Bankai will look like? What new powers will he unleash on the Super Star Hero? Let’s find out in Bleach 564. This Super Star Hero character is really getting annoying, including his sidekick fan who keeps on coming back after being sliced or cut into pieces. Perhaps the only way to defeat the Super Star’s Fan is to hit him with one powerful blow, disintegrating and turning him into ashes. Renji is the first one to show us his new found powers in action. Actually, Renji’s sword was not the first one revealed after their Asauchi training. We first saw Ichigo’s dual blade and now it’s time for Renji to show to us his new blade. Based on the last page of the chapter, it was obvious that Renji’s Bankai, Hihiō Zabimaru, had a new look and form. Honestly, I’m not too sure if that was Bankai or just Shikai. Renji did not said the magic word, “Bankai”, when he released it. Well, if that was not Renji’s new bankai, I’m 100% sure that his Bankai will have a new look as well. Renji’s new blade form seems to resemble a large claw, like Wolverine’s. Only that it’s coming out from Zabimaru’s mouth together with his hand. I’m very excited to see how will Renji use his new blade. I’m sure Super Star Hero won’t last any longer, even after releasing his Vollstandig. 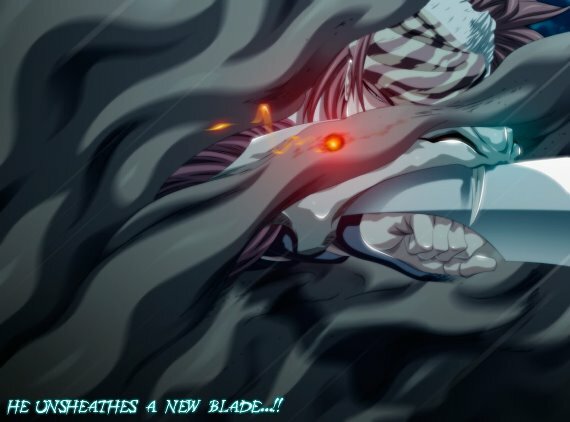 What do you think of Renji’s new Blade guys? Do you think it’s his new Bankai or just a new Shikai look? Share your thoughts below. Again, Bleach 564 release date is probably by January 15 or 22. This means you won’t be expecting any Bleach 564 spoilers anytime soon. Since spoilers are usually released a day before the chapter is released. But let’s just wait for the chapter to be released anyway. I’ll update this article or post an update once Bleach chapter 564 is released. Stay tuned!